Why can't I login via SSH as root on a VPS with Plesk? With our installations of web control panels such as DirectAdmin, cPanel or Plesk, SSH-access for the 'root'-account is disabled by default. This is due to security precautions (on average more than 80% of all brute force attacks on port 22 use 'root' as a user). If you try to log in via SSH as 'root', you will therefore always get a 'Permission denied' output. 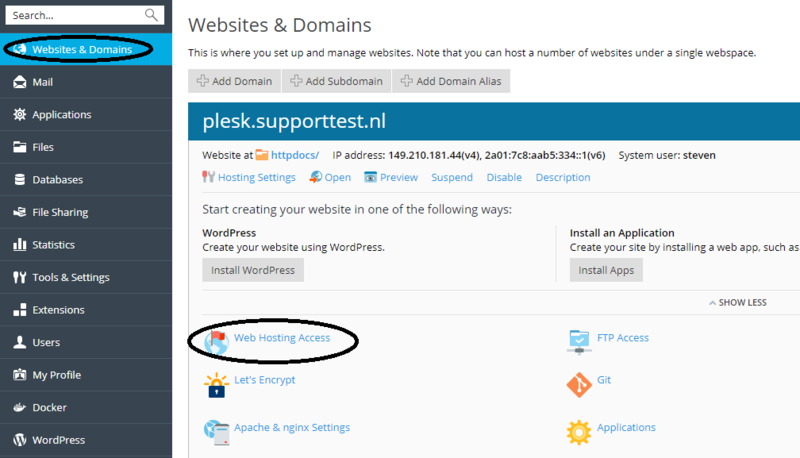 So how do I login via SSH on my Plesk-VPS? We’ll be creating a new user in Plesk that has SSH (and FTP) access. We won’t be giving access to the root user in this guide for security reasons mentioned earlier. Please note that the steps are slightly different depending on whether you use Plesk with the Power User View or Service Provider View. In Plesk click on 'Websites & Domains' > 'webhosting access'. Add a new user by providing a new username under 'System user', give it a strong password and make sure you change 'Access to server over SSH' from 'forbidden' to /bin/sh/. Finish by clicking on 'Apply' and then on 'Ok'. That’s it! You can now access your VPS through SSH and FTP with this user. In the left hand menu, click on 'domains' and then click on the name of your domain in the 'Domains' page. Click on 'webhosting access' in the management page for your domain that appears.